Before the interview, here's a little info about Nancy. Nancy is on the right. Nancy was born in Sioux City Iowa, left the cold of the Midwest in 1991 and only returns to see family in the summer time. She spent ten years traveling the world as a US Marine and settled in rural SC with her husband, two children and three dogs. She enjoys RVing with her family, writing Paranormal Romance/Urban Fantasy and reading all types of Paranormal and Young Adult literature. Thank you so much for the interview and for hosting the Meeting Destiny book tour! It’s great to be here today! In three words, how would you describe your writing? Reading blogs about the daunting process for traditional publishing, (e.g. finding an agent, writing a proposal, negotiating royalties, contractual commitments, tour commitments, etc) soured me on it before I ever gave it a try. I had found some posts from Independent authors, one was really heart-wrenching – the author had been trying to get a book she believed in published for more than ten years without success; she self-published, and sold 30,000 copies in three months. I was elated when it sunk in that the power had just shifted. Large, faceless publishing agencies no longer had the power - the readers did. Readers are now able to decide what books are best sellers, what an amazing concept! As far as writing, what do you hope to accomplish the next 2 years? I’ve started a second series, I’d like to publish the first book Sept 2012, book two Jan 2013, book three May 2013 and the final book Sept 2013. I plan to write the same way I did with the Destiny Series, having finished the first draft on the whole series before I publish the first book. It takes a little longer in between series, but it allows me to make sure I insert elements in earlier books that have much more relevance in later books. How did you come up with the title for Meeting Destiny? Do you have a process or do you wait for inspiration? Meeting Destiny was the best description I could come up with, but I’m thinking of letting fans choose the book names for the next series. The Destiny Series had been in my head screaming to get out for a while. I try to write 30-60 minutes per day, but I’m not rigid, I can be convinced to set my laptop aside and read a couple bed time stories or watch television with my kids. The series I’m working on now is also screaming to get out. What was your greatest challenge in writing Meeting Destiny? The hardest part was writing Seth’s character. It’s really difficult to write a great character that is sweet, has a lot of charisma, is in love with the main character and still gets rejected. I have a husband, two sons, three dogs and a full time job that I love. My days are completely jam packed with everything from helping with homework, playing fetch in the back yard, RVing with my family and just balancing life. Although I love writing, my life really doesn’t revolve around it. Who are your top 5 favorite authors in any genre? Shelly Crane, Charlotte Abel, Shannon Dermott, Rachael Higginson, and Nicole Williams. All have incredible YA Paranormal Series that I read until my eyes bled! What 3 books on your bookshelf can you not live without? Shelly Crane’s Significance, Charlotte Abel’s Enchantment and Shannon Dermott’s Beg for Mercy. All three of these authors are friends, mentors and idea sounding boards. It was their books that made our friendship possible. I’ll treasure all three of their books for the rest of my life. Finding a good book is easy - there are literally thousands of great ones to choose from. Finding an author whose work you adore AND that author is someone you’d love to meet in person and hang out at Starbucks with is a real treasure. What flavor of ice cream is Meeting Destiny? Blue Bell Moollenium Crunch – I bet I ate 20 gallons of this flavor while I was writing Meeting Destiny!! Ice cream and snickers bars are a daily indulgence for me. What do you love most about your readers? So far, reader feedback has been overwhelming! I can’t tell you how many times I’ve read a review, a tweet, or an email and shared it with my family. I absolutely love reviews where readers insert pictures and videos of their reaction to the story. The words “Thank you” are grossly inadequate, I’d like to tell them: “You Rock!” I’ve said from the beginning that I am better at writing than I am at marketing; the success of the Destiny Series is 100% a result of the fans. I couldn’t be more humbled or appreciative of a group of people. Beginning in mid-March I reduced the price of Meeting Destiny to FREE as my thank you to the fans – for any new fans out there – I’d love to hear from you! Wonderful answers Nancy! Thanks for being here today and offering your fans, new and old, a chance to win Meeting Destiny! Be sure to stop a SupaGurl Books, April 30, 2012, for the grande finale giveaway! For info on SupaGurl Tours, click the banner! I love it when an author says they have more screaming to come out, just means there is more to come! A book junkie's greatest joy. Thank you for taking the time and effort to share with us today. Very nice interview. I liked the questions and finding out more about the writing process. 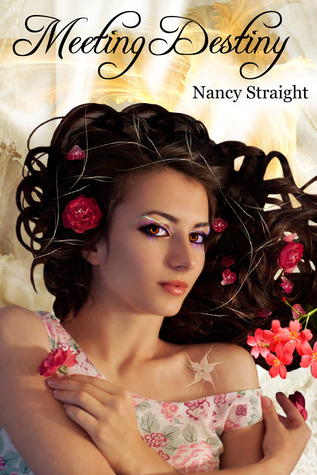 Love Nancy and Love the Destiny trilogy!!! Super Fantastic! !